It's Design Team B day at Aud Sentiments. Stamp Art Designs by Kathryne provided the team with images. I chose to use Ari & Toby, a darling pair, don't you think? The sentiment is from MFT and I used a Spellbinders label die for the pink background. Thanks for stopping by! Be sure to stop by Aud Sentiments and check out the rest of the team's creations! This is a SUPER card! Oh how I LOVE that paper...I have my own, saved in my stash for a very special project! I love this girl...love that umbrella and I love the design. How very cute! I love that DP curved to create the white space for the sentiment Kathy - what a great look! Really nice looking card! 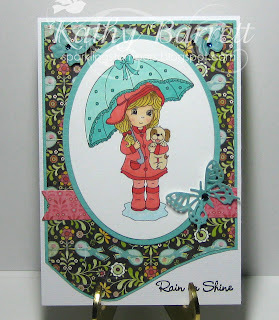 Adorable card Kathy! I love this image. I bought it quite a while ago; so now I am more motivated to use it. You did a fabulous job on this card and your coloring is outstanding! How did you get the curve at the bottom? The DP is gorgeous as well. Thanks so much for playing along in my "childhood" wordplay challenge at My Creative Moments.